Robert F. Kennedy Department of Justice Building, Washington, D.C. The United States Department of Justice (DOJ) is a Cabinet department in the Federal government of the United States. Its jobs are to enforce the law, defend the interests of the United States according to law, and to ensure fair and impartial administration of justice. 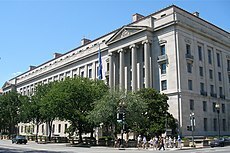 Parts of DOJ include the Federal Bureau of Investigation, the Drug Enforcement Administration, and prosecutor offices in about a hundred districts in the United States. The DOJ is administered by the United States Attorney General, one of the original members of the cabinet. This page was last changed on 18 March 2019, at 16:16.